This little beauty of an EP comes straight from the crypts of the undead. Admittedly, I was skeptical of how much I would enjoy this record. I mean, with a name like Cult of the Psychic Fetus, I thought it would be silly, but as with many great records, one will likely find something cool if the album art is on point. So, take it from me that the art for this EP is solid, and so is the record. This self-titled is a gothabilly gem that mixes the attitude of The Cramps-like rock n’ roll with monster mash tendencies. 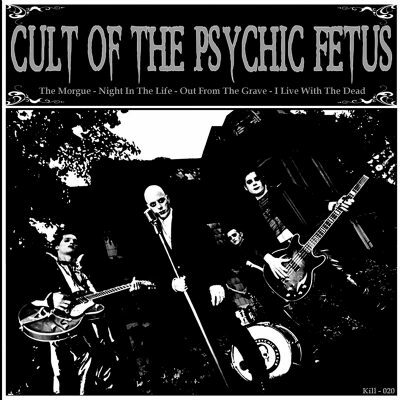 Sure, the themes of the dead and undead may be predictable, but Cult of the Psychic Fetus are a tight group with a tight sound. These guys really know how to play their rock n’ roll. It touches on the smoothness of the 1960s with the edginess of a band haunting the depths of the garage. “The Morgue” starts this EP off with a moving and shaking and plucking of surf-driven riffs. Prepare to twist close to your ghoulish partner and get down. “Night In the Life” is a fun play on words. Perhaps it’s a nod to The Beatles’ “Day in the Life”? There’s only one way to find out, and that is to exorcise the answer from the lads in the band. Until then, dig this spooky, surfy ditty. “Out From the Grave” is possibly my favorite track on this EP. It’s a jumping number with prominent, bass-heavy plucking that adds something special to this dark but groovy song. The background vocals add a definitive moodiness to “Out From the Grave.” Be sure to sink your fangs into this one. “I Live With the Dead” is a mellow mooder. It still has a surf rock element that drives this tune. Like other numbers on this EP, the theme here is spooky and haunting. In other words it’s dark rock n’ roll. It’s the kind of music that feeds off the notions death and decay. This is done with a smooth feel that leads me on, swaying ever to the notions of being under a sort of incurable spell. I have to say, I really dig Cult of the Psychic Fetus, and honestly, I didn’t think I would. These undead cats have one hell of a sound. They’ve been around since 1992 and have recorded scores of material. However, this EP is their first vinyl release and is only available through Killjoy Records.